The emergence of the modern bicycle can be traced back to the “safety bicycle” designs of the 1880s and 1890s, which introduced a gear ratio between the pedals and the rear wheel. 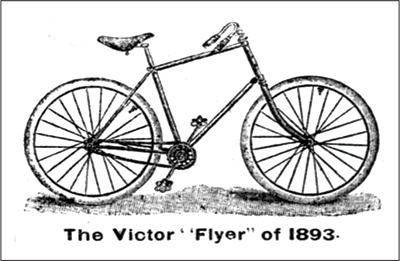 For the next 100 years, bicycle-frame design remained fairly consistent—the 1893 design shown in Fig. 1 would not have looked too out of place in a 1980s bicycle shop. Steel-tubing frames have been the construction material of choice, but other metals gained popularity in recent decades. This came as a result of their higher strength-to-weight ratios, particularly true with aluminum, but also titanium alloys. Fig. 1—Bicycle designs remained similar from the 1890s through the 20th century. Fig. 2—During the 1980s, the advent of carbon-fiber-reinforced polymers (CFRPs) enabled a radical breakthrough in frame design. Photo courtesy of Science & Society Picture Library. A radical breakthrough in frame design came with the advent of carbon-fiber-reinforced polymers (CFRPs). The manufacturing methods needed differed greatly from those used with metal tubing. Some CFRP frames followed the typical “double-triangle” arrangement seen in metal frames, but noticeably unique designs also started to appear. The first monocoque CFRP frame was designed by Mike Burrows in 1985 and a later evolution of the design can be seen in Fig. 2. Burrows’ creation demonstrated that using a new material and/or manufacturing method could lead to radically different frame designs. Additive manufacturing (AM) would come to exploit this idea to the extreme almost three decades later. Fig. 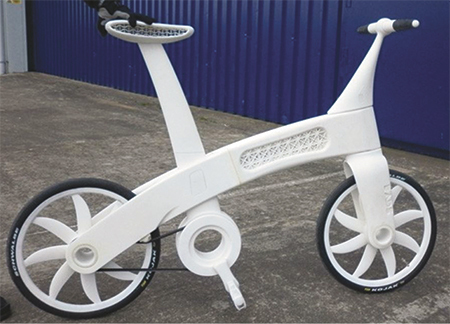 3—Polymer additive manufacturing (AM) offers lower cost and larger build envelopes, and the first complete bike frames built using AM were made with polymer materials. An early example of a nylon frame printed via laser sintering is the Airbike from the Airbus Group. Photo courtesy of Airbus Group. Fig. 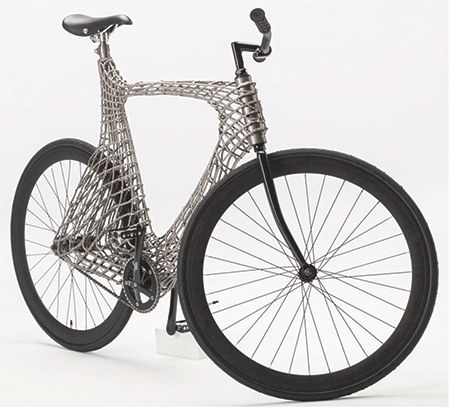 4—An excellent example of the use of lattice structures made possible through AM is this stereolithography-printed bike frame from James Novak of Griffith University in Australia. Photo courtesy of Griffith University. Fig. 5 (left) and Fig. 6—Bike frames made using metal AM recently have emerged, including a titanium-alloy frame made by Renishaw for Empire Cycles. Selective laser melting was used to make several components in a single setup (left), which then were removed, finished and welded together. Photos courtesy of Renishaw. Fig. 7—Resulting from a Technical University of Delft design, this frame was built as a single stainless-steel component using a robotic-welding process. The frame weighs about the same as a standard steel frame, but weight potentially could be reduced using lattice-element optimization. Photo courtesy of Technical University of Delft. Fig. 8—Airbus subsidiary APWorks invested in the design and manufacture of the Light Rider, a motorcycle that takes frame design a stage further than for bicycles because the forces transmitted are much higher. Topological optimization was used to create an extremely light frame (about 13.2 lb.) in laser-sintered aluminum. Photo courtesy of APWorks. Fig. 9—The Robot Bike Co. produces the R160 bike frame through a combination of selective laser melting from Renishaw and CFRP tubing. Each bike is designed and manufactured in accordance with the rider’s body measurements. Photo courtesy of Robot Bike Co. Initially, 3D metal printing was used only to produce subcomponents of bike frames due to its high cost and limited build envelopes. Typical of this was the production of steering stems and other highly stressed parts. They then could be assembled with conventionally manufactured tubing. Polymer AM offers lower cost and larger build envelopes. The first complete bike frames built using AM were made with polymer materials. Some of these frames were very similar to designs of metal frames, whereas others were more radical in their shape. 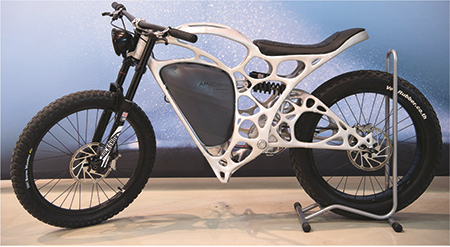 An early example of a nylon frame printed via laser sintering is the Airbike from the Airbus Group (formerly EADS) in 2011 (Fig. 3). Many other designs have followed, some of them departing from the usual solid appearance and moving toward a lattice structure for part of or the entire frame. 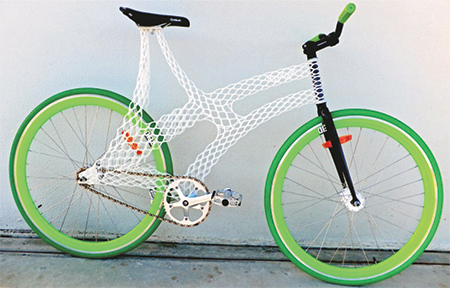 An excellent example of this is a stereolithography-printed bike frame (Fig. 4) by James Novak of Griffith University in Australia. Such open lattices can take advantage of lattice-element-optimization algorithms, which will add more material to elements where strength is needed while using minimal material from less-stressed regions to save weight. Whole bike frames made using 3D metal printing recently have emerged. 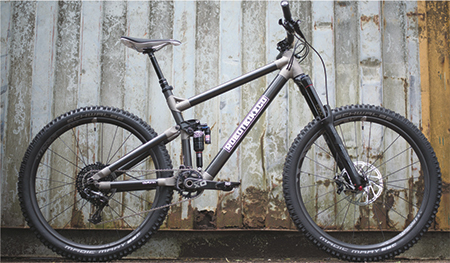 An early example from 2014 is the titanium-alloy frame made by Renishaw for Empire Cycles. Selective laser melting was used to make several components in a single setup (Fig. 5), which then were removed, finished and welded together (Fig. 6). Topological optimization was used to reduce weight, but the overall design still looks similar to a conventional mountain-bike frame. Since this early foray into metal-AM bike frames, several more radical designs have appeared, some making extensive use of the lattice-structure method seen in the polymer frame from Griffith University. One such design comes from the Technical University of Delft (Fig. 7). The frame was built as a single stainless-steel component using a robotic-welding process. The frame weighs about the same as a standard steel frame, but weight potentially could be reduced using lattice-element optimization. In the future, the use of optimized lattice structures or topology optimization could yield metal frames that are as light as CFRP structures. This is desirable because the material properties and manufacturing processes associated with metals are better understood and more mature than those for CFRP. This is probably one of the reasons that Airbus subsidiary APWorks invested in the design and manufacture of a metal-AM motorcycle frame. Known as the Light Rider, the motorcycle (Fig. 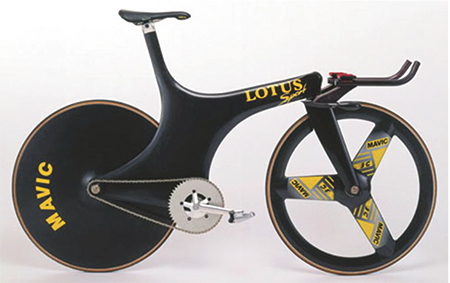 8) takes frame design a stage further than for bicycles because the forces transmitted are much higher. Topological optimization was used to create an extremely light frame (about 13.2 lb.) in laser-sintered aluminum. Unlike most of the AM bicycle designs discussed previously, the Light Rider is commercially available as a short-range, electrically powered urban vehicle. 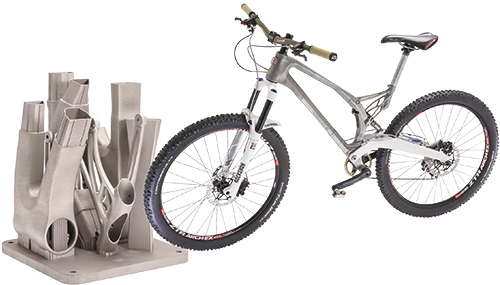 The application of 3D metal printing to bike frames presents an interesting design challenge. In addition to a reduction in material and weight, coupled with optimized strength, AM offers the potential to achieve stunning styling and aesthetics. It also makes the production of custom bike frames economically viable. The Robot Bike Co. produces the R160 bike frame through a combination of selective laser melting from Renishaw and CFRP tubing, as shown in Fig. 9. Each bike is designed and manufactured in accordance with the rider’s body measurements. The product is priced at around $5800.